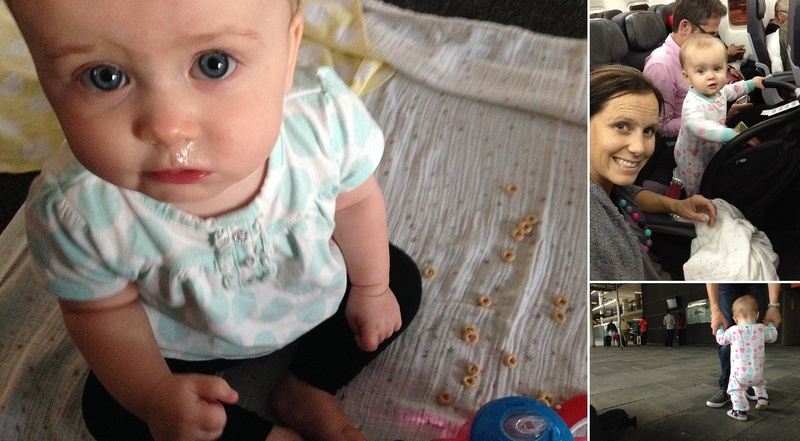 Travel: featuring a baby with a cold | .liveit.loveit.blogit. The ride to the airport in Edmonton was foreboding. C cried almost the entire way. It was only just as we pulled up to the airport that she finally settled and went to sleep. We didn’t realize in the car, but baby girl was getting a doozy of a cold. The flight to Toronto was a series of opposites, either she screamed and sneezed and snotted all over, or she was sleeping calmly, attached to me in her carrier. We were hoping to use lounge passes in Toronto, but were thwarted when the lady pointed out that they were domestic passes only. Instead, we made ourselves a little play area at the gate and let C crawl and stand (and sneeze!) as much as possible before the flight. When checking in, it looked like the flight wasn’t full so we took a gamble and booked two aisle seats, leaving the middle seat empty between us. Just before our flight, J confirmed that no one had checked into that seat so we got to bring C’s car seat on board! If I make it big, I’m always going to pay for an infant seat. It was such a blessing. Especially with a sick baby. Despite having a sick, sleepy, snotty, feverish baby, we didn’t have any major meltdowns—mostly just some whimpering throughout the flight. All things considered, the flight went incredibly well. We have ourselves a little trooper! When we got off the plane, things were going so well that we decided to take the bus to Sitges to save some €s (and to give C a chance to be unconstrained for awhile)! It was a quick and easy €6 ride each from the airport in Barcelona to Sitges, a beach town just west of there. Our airbnb host met us without any problems and showed us to the beautiful apartment we booked for four night to unwind and get over jet lag. After a bit of unpacking and playing, we went out for lunch, and then strolled around the beach boardwalk and the central part of town. I love it. Sitges is known internationally as a gay resort, and the centre is a mix of young local families, day trippers from Barcelona, a whole lot of men, and a few lingering tourists left over from the summer. 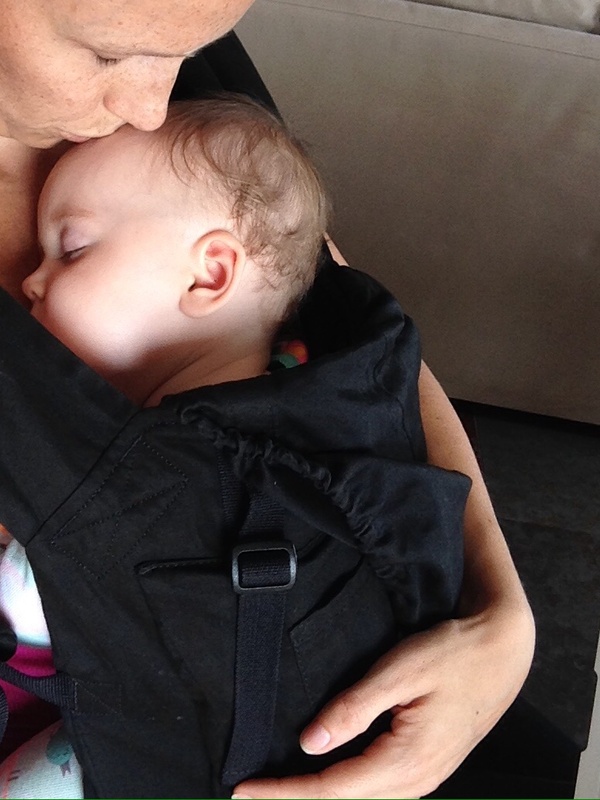 There are hundreds of local restaurants, bakeries and cafes, all of which are baby-friendly. I love Europe. We stopped at the grocery store and … wow … are groceries ever inexpensive in Spain; €0.26 sparkling water, a 4.5lb roasting chicken for €4.37, the world’s cheapest olive oil. We even splurged on the €1.85 table wine. 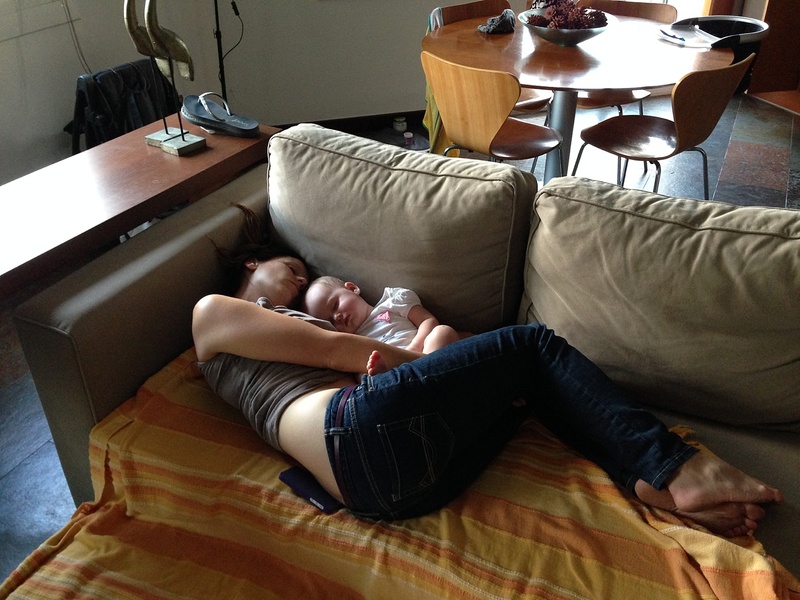 C and I had a little nap while J was on a business call. What a good snuggle! But then we got jet lag. Combined with a baby cold. C went down to sleep at about 9:00 without much fuss. But then proceeded to wake up screaming hourly until 3:00am. From 3:00am – 9:00am she woke up every three hours. We all felt pretty worn out when we woke up at 9:00am on Thursday morning so J set off to the local bakery to get us croissants and café con leches. He’s the best. We had a relaxed morning eating (mostly the adults, C’s cold has really suppressed her appetite—both for milk and for food) and playing! This baby is on the move; everything is dangerous! More so on tile floors! When we booked all our accommodation for this trip, we didn’t anticipate having a baby who pulls herself up on everything, so we need to be extra vigilant. C had a long nap in the morning (in her carrier, but I’ll take what I can get) and we got a couple of hours of work in. After she woke up (and after even more playing) we set off for lunch and a walk around town. 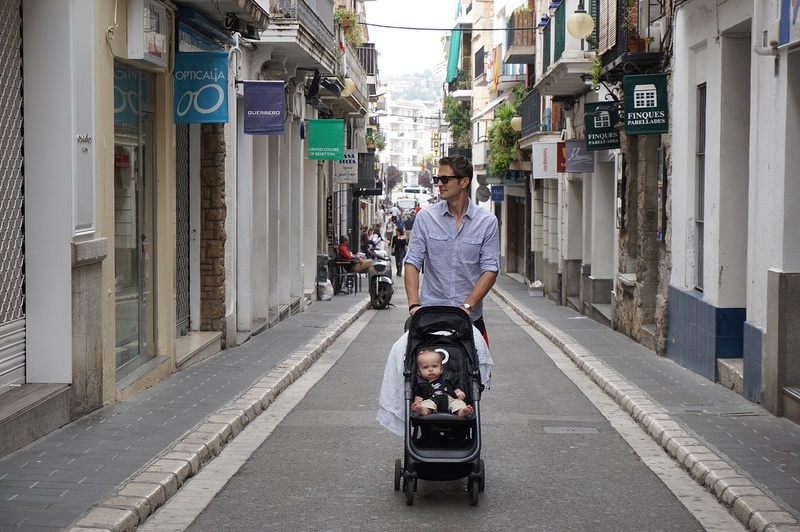 This town isn’t nearly as old as the rest of Europe, it’s got wide pedestrian streets ideal for a stroller! Lunch was amazing. 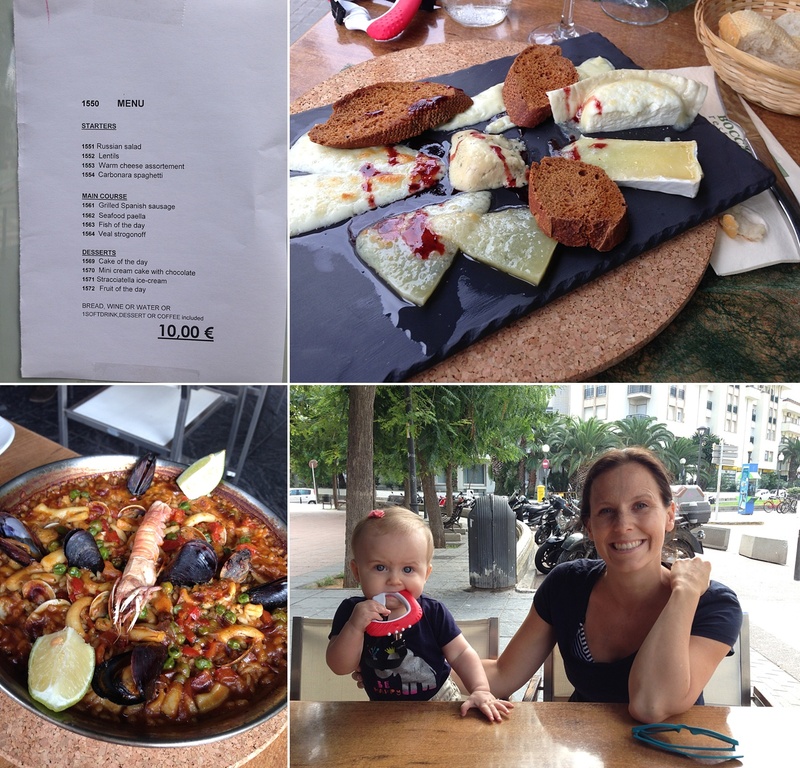 We chose a cute little Mediterranean restaurant with a €10 Menu del Dià. We got a drink, a starter (my warm cheese plate would have cost $15 itself at home), a main (J’s paella would have cost at least $15 itself at home), and a coffee for €10 each. Despite her snottiness, C was a flirt and a charmer, getting scooped up by the server for cuddles part way through our meal. Again, I love Europe. Our evening was spent back at home on a business call (this time I was on the call while J and C played) with a roasted chicken for dinner. Jet lag hit us differently last night—C went down at around 8:30, and woke up a couple of times until 11:30 (but was able to settle herself back to sleep). But then she woke up and was wide awake making adorable baby noises and using me as a jungle gym until about 1:30. Not ideal. At least when she fell asleep at 1:30 she was out until 8:30, so we all got a bit of sleep (and I got 6 hours in a row, which is WAY more than I’ve been getting recently)! So we’re doing pretty well. C’s cold has moved into her chest, so her awful sounding cough is breaking my heart. The upside is she’s a bit more snuggly than usual and it doesn’t seem to be bothering her that much! It’s almost noon and she’s been down for a nap for an hour. This is my view from here. Aww! Despite C’s cold, looks like you guys are having a great time making memories! Have fun! Amazing! I don’t know where to start… love the entry, love you three, what an adventure. I couldnt even imagine………… Great pictures and details! Not share what I am more jealous about the moments with that sweet babe or all that good food!! !